The rapid injury treatment you need— the attentive care you deserve. Minor injuries can occur suddenly during an activity such as a sprain or a strain. At Clermont Urgent Care, we are fully equipped to help you with sudden minor injuries requiring urgent medical attention, but not the ER. No appointment is needed and walk-in patients are always welcome. 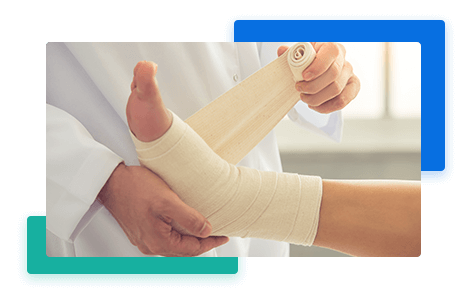 Our minor injuries services include evaluations for fractures, lacerations, cuts, sprains, contusions, burns, and more. Explore some of our minor injuries services below. For most minor injuries, an ER visit is not always necessary. At Clermont Urgent Care, we are fully equipped to provide rapid treatment for a wide range of minor injuries. We strive to ensure your comfort and work efficiently to provide healing treatment— because, to us, you’re more than just a number to be processed. At Clermont Urgent Care, we put the care back into urgent care. We will do our best to evaluate you, but there is a limit to how much can be done for severe injuries at an urgent care facility. For this reason, if we determine you require more resources to properly treat your injuries, we will refer you to the ER.